Image Comics is pleased to announce that issues #17-31 of the bestselling series DEADLY CLASS (soon to be a SyFy TV show) by Rick Remender (DEATH OR GLORY, SEVEN TO ETERNITY, LOW, BLACK SCIENCE) and Wes Craig (THE GRAVEDIGGERS UNION) will be collected into a massive hardcover deluxe edition available this October. PORTLAND, OR, 6/28/2018 — Image Comics is pleased to announce that issues #17-31 of the bestselling series DEADLY CLASS (soon to be a SyFy TV show) by Rick Remender (DEATH OR GLORY, SEVEN TO ETERNITY, LOW, BLACK SCIENCE) and Wes Craig (THE GRAVEDIGGERS UNION) will be collected into a massive hardcover deluxe edition available this October. 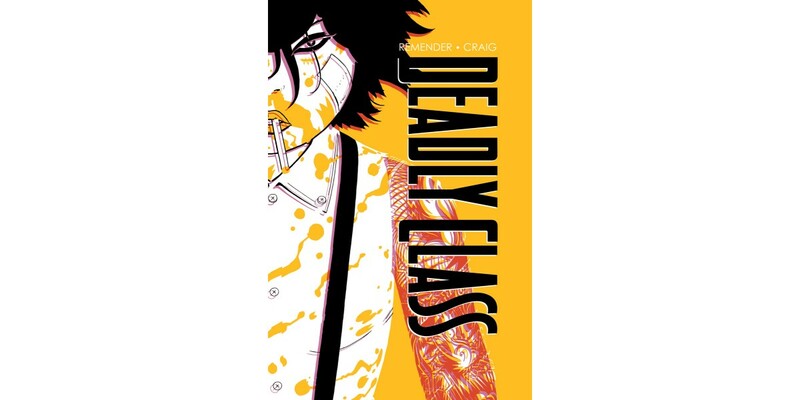 DEADLY CLASS DELUXE EDITION, BOOK TWO: THE FUNERAL PARTY collects story arcs four through six of the ongoing, darkly humorous drama centered around the lives of ‘80s teens training in a secret academy to either become assassins or stand up and become humans. DEADLY CLASS DELUXE EDITION, BOOK TWO: THE FUNERAL PARTY (ISBN: 978-1-5343-0841-1, Diamond Code: JAN188510) will hit comic book stores on Wednesday, October 10th and bookstores on Tuesday, October 16th. The final order cutoff deadline for comic book stores is Monday, August 6th. It can be pre-orderd on Amazon, Barnes & Noble, Books-a-Million, IndieBound, and Indigo.